When Natasha Nepveu decided to leave the fashion industry, she headed for culinary school at the Culinary Institute of America. “I always liked working with my hands and I love to cook,” she said, so the progression seemed like a natural one. After she graduated, she went to work in several New York restaurants, preparing for the day when she would open her own. That goal brought her to Flemington, N.J., to live, and six weeks ago she opened Toast, her sandwich and quiche stand at the Stockton Farmers Market in Stockton, N.J.
Nepveu began with the concept of open-faced sandwiches. She liked the idea of sandwiches because “I could make it work at different levels,” she said, and turn a simple meal into something special. After input from her customers she added closed sandwiches and then quiches to satisfy a demand for breakfast foods. Most of her sandwiches can be made open-faced, in a baguette or on multi-grain bread, or served over salad greens. 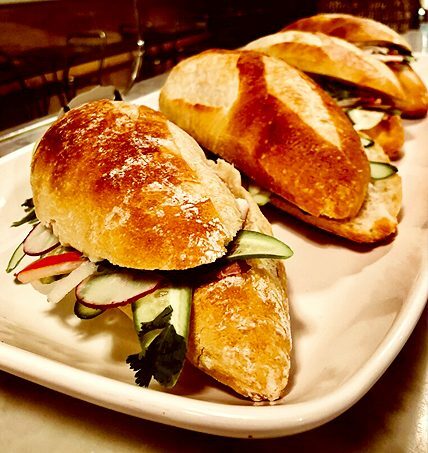 At her customers’ requests she developed a Cubano sandwich made with pate, roast pork, thinly sliced radishes and cucumbers, cilantro and her own sauce. It has become a top seller along with her bahn mi, a Vietnamese sandwich. Other favorites include her brie fondre, which is French for “to melt,” her avocado smash, chicken salad made with grapes and chopped apples and her egg salad. Each week she makes a gluten-free tart that sells out, plus vegetarian and meat-eaters’ quiches. The market is open three days each week and Nepveu said each day brings a different clientele. On Friday nights when the restaurant vendors are open for dinner, “people come with a bottle of wine” to accompany their quiche or sandwich, she said. On Saturdays you have shoppers who want breakfast or lunch when they come to visit the regular vendors selling chocolates, produce, meats, pastries, doughnuts, tea, coffee, jewelry and gourmet food products. Sunday brings customers determined to pick up prepared foods for the week ahead, she said. They buy sandwiches and quiche from her, pulled pork from Pulled Fork BBQ, soups from Oldwick Soup Company, meats and chicken pot pies from Highland Gourmet, mushrooms and olives from Mushrooms Etc., meats from Manny’s All-Natural Meats, fish and shrimp from Metropolitan Seafood and chips, salsa, tamales and tacos from El Mariachi. Nepveu uses breads made in New Jersey and local ingredients whenever possible. When warm weather comes she expects to offer more salads, but for now she is focusing on her sandwich menu. “I really enjoy making sandwiches,” she said. 4-8 p.m. Fri., 9 a.m.-4 p.m. Sat., 10 a.m.-4 p.m. Sun. Toasts $7.50-$9.50, quiche with salad $8-$10, sandwiches $6-$11.50. avocado smash toast, Cubano sandwich, bahn mi, chicken and egg salads. Copyright ©2017 Bucks County Herald, Inc. All rights reserved. previous post: NJ.com: Sweet Melissa’s Patisserie Wins N.J.’s Best Bakery!